Nefesh Mountain is coming to TBO! 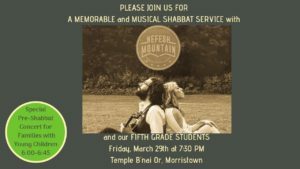 Join us on Friday, March 29 for Nefesh Mountain. Starting with a special 6:00 PM performance for our younger members, friends, and families. Then at 7:30 pm they will join our 5th Graders and be part of our Friday Shabbat Service!